Use the CV XE GIS Site Analysis tool to examine geographic-demographic-economic characteristics of points (e.g., students, schools), areas (e.g., ZIP code areas, school districts), and lines (e.g., street segments) by selecting geographic objects through use of user defined geography. 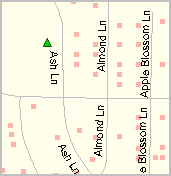 The user defined geography can be determined through the use of a mouse and the GIS map view. Flexibly create a circle to encompass geographic objects of interest or select by other means described in this section. A table is created showing geographic-demographic-economic attributes of each geography and a summary for all selected geographies. access any ACS 2010-2012 or Census 2010 SF1 or Census 2000 SF3 subject matter item(s). - links your local data with API/Internet sourced data. - attaches user selected demographic-economic item to address (e.g., median household income). - automatically creates shapefile and adds to GIS project. Operations described in this section continue to operate but with improved and extended features. Contact us to get started with your analyses today (mention site analysis in text section) ... or call (888) 364-7656. 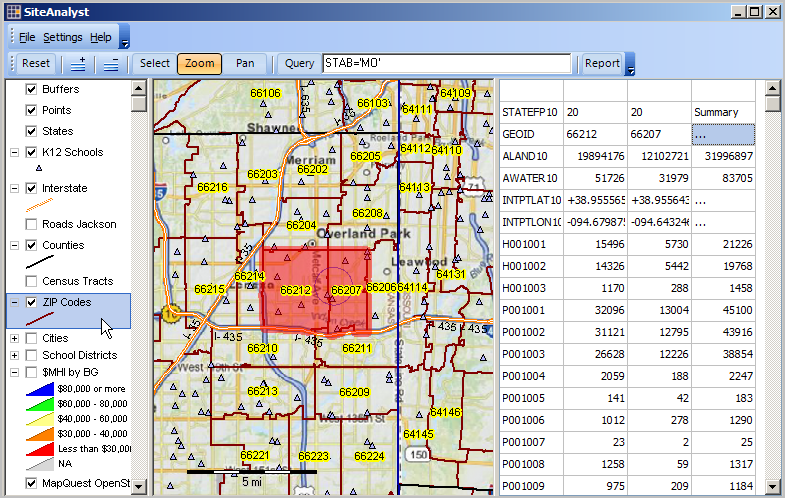 An example of using the CV XE GIS Site Analysis tool is shown below. 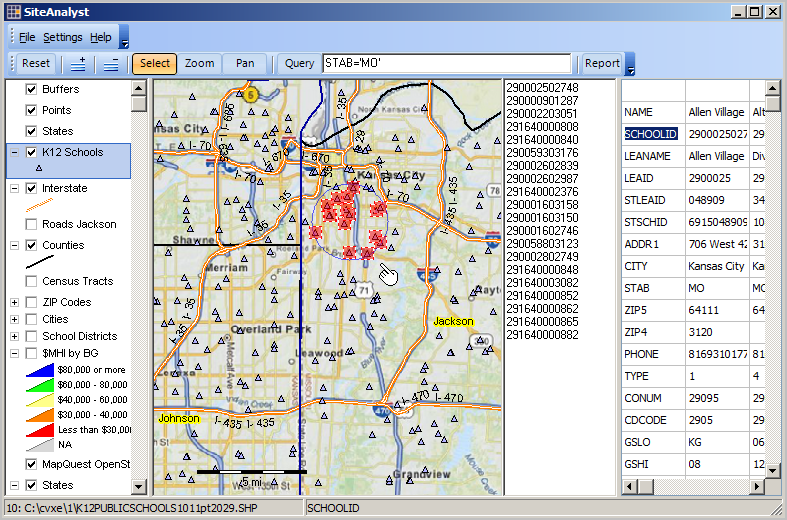 This SA example uses a GIS project focused on the Kansas City metro area; more about using this project -- http://proximityone.com/cv_kansascity.htm. SA can be used to analyze sites anywhere, globally. A layer is selected for site analysis. 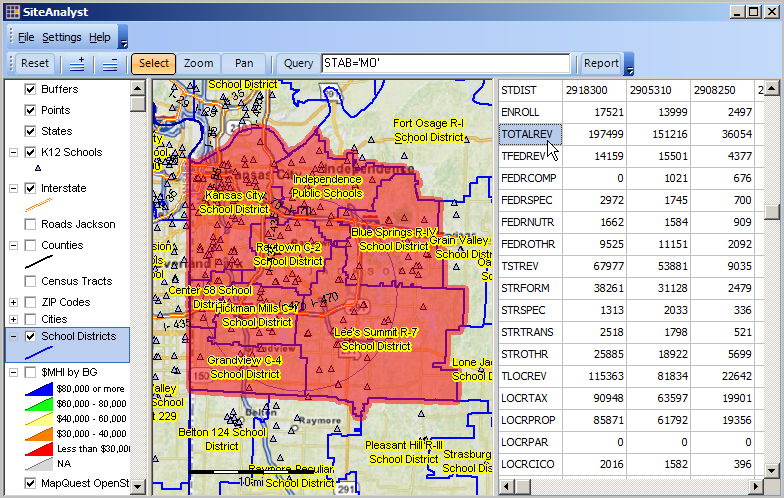 In this example K-12 Schools (triangles in the map) are selected -- layer highlighted in legend at left of map. 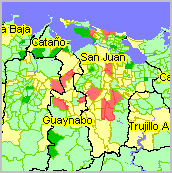 The mouse is used to select a set of schools as shown on the map. The selected schools are highlighted and the circular selection area is shown (blue circle). The school id for each of the schools selected are shown in the listbox to right of map window. Attributes of each of the selected schools are shown in the grid/table at far right. All data for each selected school are in a grid column. A summary for all selected schools is presented in the rightmost column (not shown in this view). 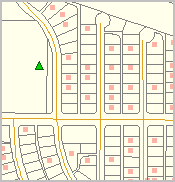 The next example uses the same GIS project as above. 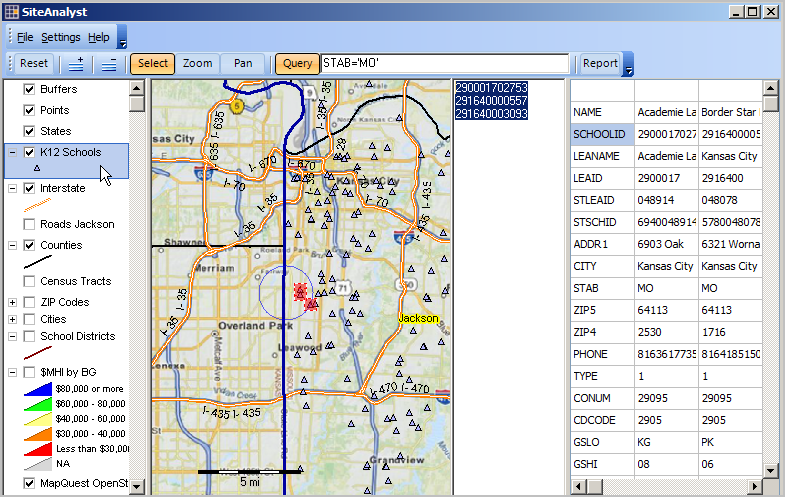 Using navigation tools, the view shown below is focused on ZIP code areas in Kansas. The ZIP code layer is the active layer as shown in legend panel. 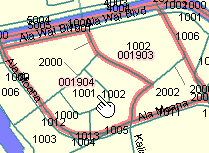 Two adjacent ZIP code areas are selected using the mouse (highlighted with red buffer overlay). A settings option was used to suppress viewing of the areas listbox. 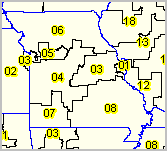 The grid shows a column for each ZIP code and a summary for the two ZIP codes (up to 250 areas could have been selected). 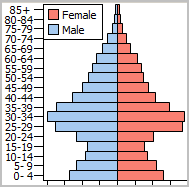 While any subject matter associated with the ZIP Codes can be displayed, this example shows use of the Census 2010 Demographic Profile Summary File data. Using the same GIS project as above and navigating back into Missouri, the view shown below is focused on school districts. The School Districts layer is the active layer as shown in legend panel. 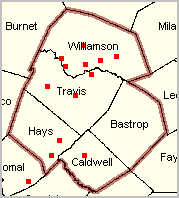 Several school districts are selected using the mouse (highlighted with red buffer overlay). A settings option (see usage in firat view on this page) was used to suppress viewing of the areas listbox. 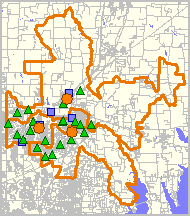 The grid shows a column for each school district and a summary for the set of selected school districts (up to 250 areas could have been selected). While any subject matter associated with the school districts can be displayed, this example shows use of the FY 2010 School District Finances data. The highlighted cell in the grid shows the item/field name TOTALREV -- total revenue in K$. 1. 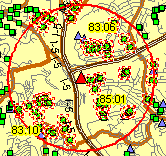 Click on the name of the layer/shapefile in the legend panel; this is the active layer and shows highlighted. 2. 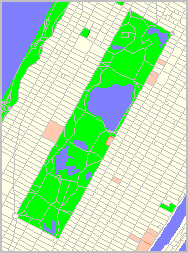 All fields in the shapefile are displayed in the first column of the grid. 3. Select the field to be used as the key or handle by double-clicking that cell in first grid column. -- that field name shows in the status bar at the base of the window. 4. Navigate (zoom/pan) so that the map view contains the area where selections are to be made. 5. Verify that the Select button on the toolbar is showing active/orange. ... hold mouse key down and drag to desired radius and release mouse button. - all objects in the active layer intersecting with circle are shown as highlighted/selected. 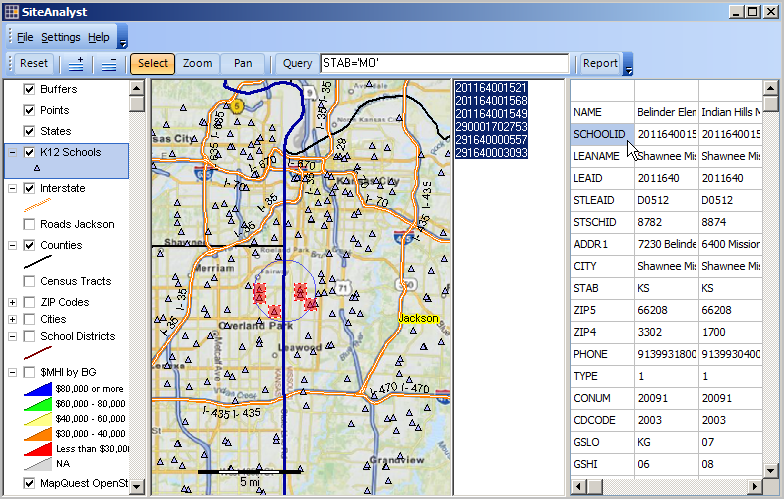 - the listbox (right of map window) is populated with the id/key field for that object/item. - a data column is displayed in grid/table at right of listbox displayed all data items for selected object. - a summary data column is displayed in the grid rightmost column showing summaries for all numeric fields. 8. Optionally click Report button on toolbar to view HTML and Excel formatted reports. 9. Click Reset button to initialize settings and optionally re-start operations at item 1 in this list. The toolbar in the next view shows a Query button and query editbox to right of the button. This feature is optionally used to place a query on the active layer. When the toolbar query is active, the Query button is orange, otherwise it is blue and not active. When a query is placed on a layer, 1) only those geographies that meet the query condition are visible and 2) only those objects are eligible for selection using the site analysis tool. 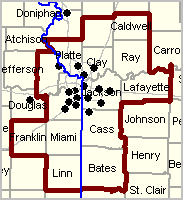 This view shows that K-12 schools have been selected that are located in both Kansas and Missouri. To view only schools in Missouri, 1) the Reset button is clicked (removing selections), 2) the K-12 Schools layer is again made active for selection based on schoolid, and 3) the Query button is clicked. 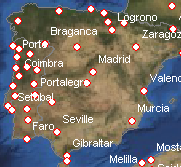 The resulting view is shown below. Selecting schools similar to the view above, only selects Missouri schools. The toolbar query makes use of an SQL structured statement in the query edit box (STAB='MO' in this example). It is important that the query use fields defined for the active layer (in this case STAB for STate ABbreviation) and that operators are applicable for the type and structure of data contained in the field (in this case the field is a 2 character string).